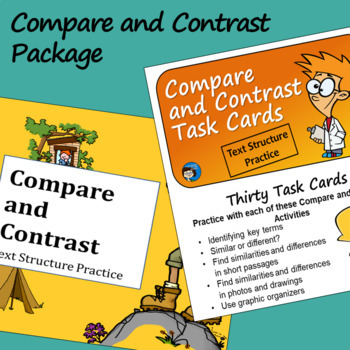 This Compare and Contrast Package includes two resources for teaching the text structure of comparing and contrasting - the Compare and Contrast Task Cards Set, and the Compare and Contrast Slide Presentation. The PowerPoint presentation explains the concept, as well as the difference between comparing and contrasting, and provides examples and student practice. There is also a fill-in notebook page for students to complete as they view the slides. 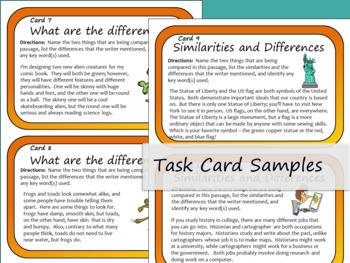 The set of task cards includes thirty large cards with a variety of activities designed for middle school and upper elementary students. 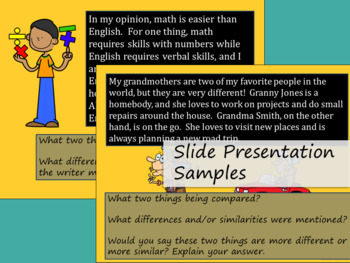 The slide presentation is great for introduction or review and whole-class practice. 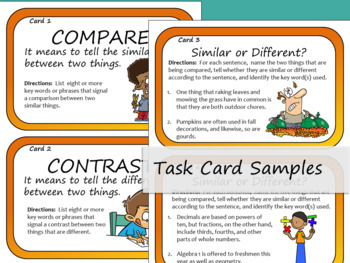 The task cards work in a variety of situations including small group or individual practice, classroom games, centers, and stations. Both resources address the concept of comparing and contrasting, finding differences, finding similarities, and finding both in a passage, using graphic organizers to illustrate the text structure, and identifying key terms. With a variety of activities, they work well with kids at various skill levels. These resources support the Common Core standards for reading informational text, identifying text structures, using text-based evidence, and reading proficiently with understanding. For task cards and slide presentations for more text structures, and for additional reading skill resources, see: Reading Skills.